Hello readers. Thank you all for staying with me. And here I am again to tell about new exciting stuffs. Today I am going to tell you about designing the interior of an office. An office is a place where we spend the major portion of the time we remain awake in a day and for five days in a week. The working condition and environment of offices directly affect the productivity, mental well-being and general health as well as the interaction of a person with their friends and family at the end of the day. So, just like our homes, an office should be carefully designed to obtain both aesthetics and functionality. 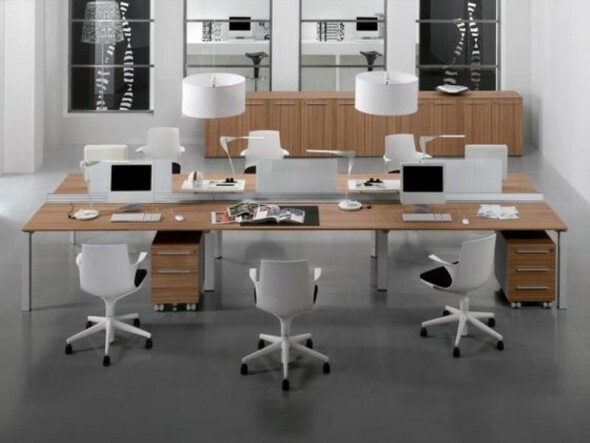 Planning an office is the most important part for office interior design. Before planning an office floor, a designer must have clear thinking of the requirements of the client including the functionality and aesthetics. The designer also should take in consideration about the office capacity, future expansion and growth plans. The design must provide adequate access for all to the stairs and fire escapes. Reception area makes the first impression on the visitors and thus should be designed wisely. The area requirement and the seating arrangement at the reception depend on the business genre of the office. Conference room, the meeting place of the office for employees and guests, should be designed to have easy accessibility from the entrance door so that guests do not have to travel across the office. Suspended ceiling should be used to conceal the air ducts, wires etc. thus to give the office an elegant look. The ceiling material should be cleverly chosen since it contributes to the reflection of light and sound. Lighting design is very important since it is critical for effective work environment. There should be adequate lighting system throughout the office for healthy and warm work environment. Floor material in an office should be carefully designed as it subject to more wear and tear. The floor material should be wear resistant. Storages like file cabinets, drawer units, shelves etc. should be designed and located as they can be easily accessible and does not consume much of office space. Toilets of an office reveal the true class of the company as well as employees. The toilets must have to be clean and adequate for the employees and separate for men and women. So, that’s all for today. Hope you can plan your office in an effective way to ensure productivity and aesthetics. Do not forget to stay tuned with us. Lots of exciting stuffs are coming here in Floorstyler blog in future.